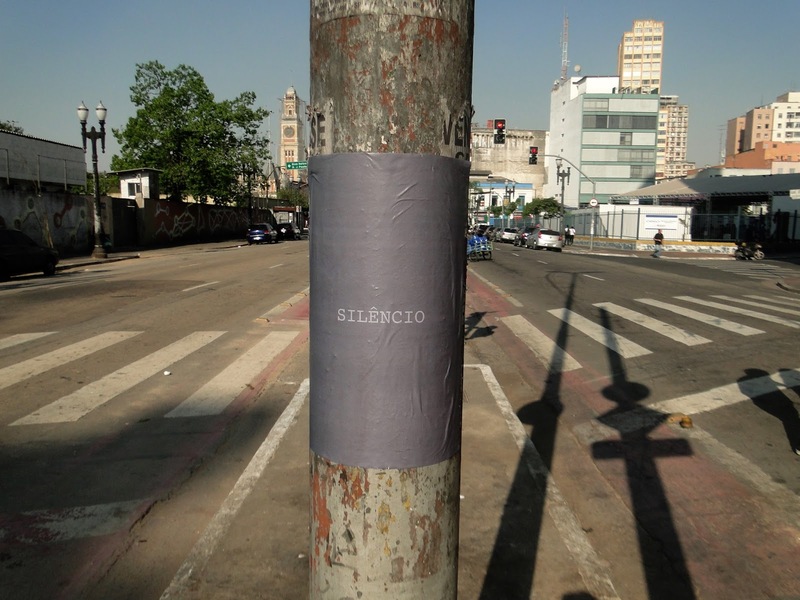 ruído cinza, silêncio cinza (grey noise, grey silence) is an octophonic piece comprising eigth posters in distinct colors, to be affixed in urban environment (preferably on public lighting posts close to each other or on opposite sides of the same road, suggesting a possible ways among them). Seven of these poster have the word "ruído" (noise in Portuguese) written in small case. The eighth of them bears the word “SILÊNCIO” in upper case. Text is always in grey color. Names of colors that fill the posters are commonly used in the audio jargon to describe different kinds of noise, establishing analogies between the frequency distribution with the color spectrum present in visible light. White noise contains an estatstical distribution of all frequencies audible to human beings sounding with the same energy (as white light which contains the sum of all visible colors). Pink noise has less energy towards higher frequency and more towards the low end, being the intensity of each frequency (f) proportional to 1/f (as red is the color with the lowest frequency range, this kind of noise is called pink, as if it were a mixture of white and red). There is also red noise, even more emphatic towards low frequencies (intensity proportional to 1/f²), which is imprecisely also called brown noise, for it's frequencies may be generated by Brownian motion, named after botanist Robert Brown who observed it for the first time in 1827. Blue noise can be obtained as the frequency distribution curve in pink noise is inverted. Violet noise comes by the same procedure applied to red/brown noise. Black noise has a somewhat controversial technical meaning, which may refer to the total absence of frequencies (silence), when thought in opposition to white noise. Last, grey noise is a randomly generated noise attenuated by a specific curve that follows the sensibility of human hearing (bigger in some frequency and smaller in others), as a way to guarantee that every frequency is perceived with equal loudness. This emphasis on perceived loudness points out to a diversity of possible grey noises, as different listening conditions and even individual characteristics of each ear may interfere in these perceived equilibrium of intensities. Though grey noise has its nuances determined by a listening condition wich is specific, localized and individual. In the urban context of São Paulo, the grey colour recently acquired a specially dramatic tone, being used to cover large amounts of urban art, taken by the municipality as unwanted noise to be silenced to "beautify" the city. Grey, noise and silence are elements that this intervention aims to somehow bring into sounding. Places chosen for the two interventions done so far stage urban space disputes which have sound as a privileged element. The Franklin Delano Roosevelt Square, the same theaters which triggered a regional revitalization were not so much time ago were fined for breaking the city noise regulation. The second one, Luz, has a place devoted to music, known as Sala São Paulo, which constitutes a strategic placeholder for an enormous real estate speculation process that has begun in that neighbourhood in the 1990's and is recently speeding up. Intervention in Rosevelt Square, São Paulo (29.08.2017). Intervention in the Luz region, São Paulo (14.09.2017). The _gestuário project unites dancer Maíra Alves, composer Rodolfo Valente and cellist William Teixeira in a recital for cello, electronic sounds and dance, shaped around two areas in which gestuality emerges as a crucial area for research: mixed electronic music (which combines acoustic instruments and electronic sounds) and contemporary dance. 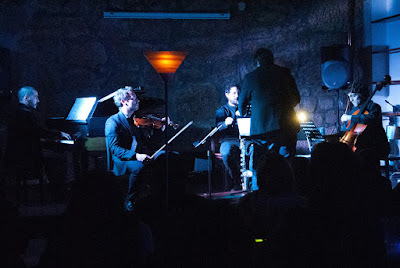 Premièred in october 2016 at estúdiofitacrepe-sp, this project visits a repertoire built out of collaborations among its components and other composers active in the contemporary music scene in Brasil, like Eduardo Frigatti, Felipe de Almeida Ribeiro, Felipe Merker Castellani, Danilo Rossetti. Beyond operating electronic sounds in all pieces, I also do my contibution to the repertoire with estudo sobre materiais resistentes nº1 (or "study on resistant materials nr. 1"). In this study, I interfered both in written and electronic form in the more than well known Suite Nr. 2 in D minor BWV 1008 by J. S. Bach. The above recording contains only the first movement, which I had "rewritten" in 2011 intended as part of a feature film by movie maker Alexandre Charro. The departure in my interferences was a diagonal line drawn on the score pege, from the upper right cornet to the inferior left corner. What stood on the left of this line was kept intact, but everything on the right was erased and completeli reelaborated from scratch, seeking a looser rhythmic, different sound emmissions (harmonics, pizzicati, etc.) and a certain harmonic strangeness. As if we were abandoning a familiar soundworld, which step by step, vanishes into a completely different sound texture, emphasized by an electronic multiplicaction of those sounds, whis is increasingly present. This score was shown cellist William Teixeira and, as a result of our conversation, in 2016 I "rewrote" the other five movements from the original suite (allemande, courante, sarabande, menuett, gigue), each with a different kind of intervention. Until this moment, this piece has been performed twice, one in Curitiba, another in São Paulo (already incorporated to the _gestuário procect). We look forward to new performances soon and, hopefully, also a full recording of all the compositions. This October bring three opportunities of listening to my electroacoustic composition work: one concert in Piauí (North of Brazil) and two in São Paulo. October 6th, 20h, there will be a a very special concert in the Café Concerto from SESC Caixeiral in Parnaíba, Piauí: memorial do granito (2015), for piano and electroacoustic sounds will be played for the first time in Brazil by Canada-based pianist Luciane Cardassi, for whom the piece was written and dedicated. The electroacoustic diffusion is in charge of the composer Paulo Rios Filho, who organizes the concert and also presents his work Ramos. Follow here the programming from SESC Piauí. Also October 6th, more than 3.000 km away, at 20h30 I'll be doing the diffusion of my acousmatic piece espectro jasmim (2012), with the 52-speakers orchestra from Studio PanAroma/Unesp, sharing the program with colleagues that are either students or alumni from the studio. 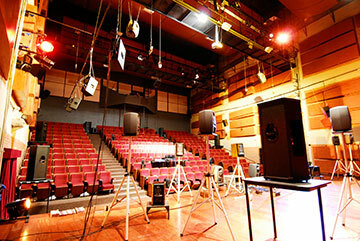 This concert is part of the XI BIMESP, the not-to-be-missed Bienal de Música Eletroacústica de São Paulo, organized by Studio PanAroma, under artistic direction of Flo Menezes. Take a look at the complete programming here and follow the event on facebook. October 15th, 17h, the project Gestuário will be presented, together with cellistWilliam Teixeira and dancer Maíra Alves. It comprises a repertoire which investigates gestualities of instrumental and electronic sounds and contemporary dance in several possible combinations. I'll present my estudo sobre materiais resistentes nº 1 [study on resistant materials] (2011-2016), in which written and electronic interferences are applied to the well-known Suíte nº 2 in D minor (BMW 1008) by J. S. Bach. Program is completed by pieces by Danilo Rosseti, Felipe de Almeida Ribeiro, Eduardo Frigatti e Felipe Merker Castellani, in which I'll be doing the diffusion of electronic sounds. Check here the complete agenda of estúdiofitacrepe-sp. The most awaited moment though (at least for me) was the première of diáspora, the new piece for quartet and electronic sounds I'd just written. For this piece I called to the stage professors Hugo Passeira (piano), José Pedro Sousa (violoncelo), Ludovic Afonso (violin) and Túlio Augusto (who triggered the electronic sounds). Carlos Silva took the bass clarinet and I assumed the conductor's role. If you want to take a look at the score of this piece while you enjoy the live-recording, it is available for download in the "works" section of this website. 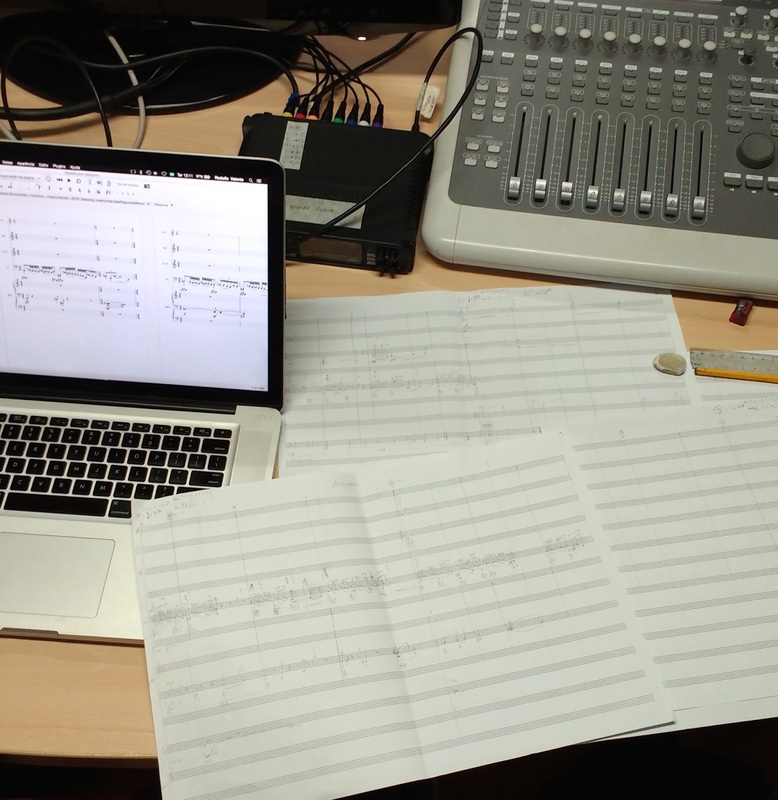 Other activities were part of this residency project supported by Ibermúsicas, like giving a composition class in Escola de Música Nossa Senhora do Cabo, in Linda-a-Velha, invided by Jaime Reis, as well as two electroacoustic music workshops, centered in the SuperCollider programming environment. The first one took place in the Social and Human Sciences School in the Universidade Nova de Lisboa and the second one happened already in Brazilian soil, in the SP Escola de Teatro. See also prior posts about this artistic residency: #00, #01, #02. Here I continue a series of texts about my artistic residency that took place in February and March 2016 in the Festival Dias de Música Electroacústica , with the support of Programa Ibermúsicas. The main result of this resindency was the composition and première of the work diáspora, for quartet and electronic sounds. Se also the prior posts here: #00, #01. The Greek word diaspora, which may be understood as dispersion, was chosen more than 2000 years ago in Alexandria to refer to the dispersion of Jewish people in the ancient world, when Jewish sacred texts originally written in aramaic and hebrew were translated into Greek, the official language of those days. Until the 19th Century, that aception of this word seems to have been dominant. However, since last century it is more and more widespread a more generalized use of this word, referring to the dispersion of any people beyond the limits of their original territory. Nowadays one refers to diasporas of people from Africa, Asia, Europe, America, etc. February, 2016. When I arrived in Portugal, the "refugee crisis in Europe" was all over the omnipresent television sets in restaurants and cafés: a great amount of people fleeing from a complicated situation in the Middle East. Even though may don't understand (ou don't want to) the issue on a broader context, leading to incidents of prejudice, xenophoby and intolerance, a more retrospective and broad glance reveals this phenomenom of big populational migrational is not new. In a not so distant example, the first half of the 20th century saw many European migrate to the Americas due to difficult times faced in their homelands. In the specific case of Portugal, it is a country that nowadays has a very high emmigration rate compared to other countries in Europe. Historically, the Portuguese diaspora is observer since at the time of the "age of discovery" in 15th and 16th centuries. Personally, even the family of my father is part or a big migration wave in the 1960s. A diaspora produces distance, but also produces new encounters. It is noticeable in American countries, whose ethnic complexity results from encouters of individuals of very different origins, in many cases unlikely to occur in their home countries (though it is necessary not to romanticize such encounters, many of them taking places in multiple contexts of oppression and explicit or implicit violence). This idea sounded attractive to me. To tell the truth, I don't have much interest in imposing a "literary" narrative or forcing symbolic associations that in general sound to me as completely alien to the music itself. An imagetic, metaphorical, poetical etc. background though is fruitful as a way to think the possible constitution of sound materials and their interrelationships. This requires a transmutation of the more metaphorical discourse into actual musical elements. But once the materials are established in their sonic concreteness, metaphores or narratives are put aside and a more abstract musical play is put in motion. Poetical hints remain just as some diffuse suggestion to the public in the appreciation of the work. Two typologies of sound material were developed: a first one extremely concentrated, both in register as in energy and a second one more rarefied and disperse, criating several intermediate situations, exploring contrasts and ambiguities. The first material appears right at the beginning of the piece, as we see depicted below. Rapid figures, mostly with reduced ambitus and quasi chromatic, mostly placed in the cello part. Those figures undergo modifications during the piece, as well in harmonic as temporal density. On the other hand, the second material seeks textural rarefaction, both in temporal aspect as in the dispersion of pitches along a broad register, seeking wider resonances. If the first material highlights the cello part, the second develops around the piano, favoring the listening of resonance. The picture below depicts a soloist moment by the piano, in which the pitches are widely spread (note the octave-above sign in the firt line's clef and an octave-below sign in the third line), as well as a relatively rarefied distribution of attacks. Along the piece, those materials end up transforming and mutually influencing each other, seeking to renovate the intest of the listener, through deviations and imprevisibilities. Relationship between electronic sound and instrumental parts also benefits from the logic of concentration and dispersion. There is some ambivalence: at the same time electronic sounds are disperse in an eight-channel space, but also ends up densifying the sound texture, concentrating more sound events inside the same time span. Each SynthDef (or “synthesizer definition”) plays specific samples from a specific file folder, corresponding to samples of each instrument (violin, violoncelo, piano, bass clarinet), and plays them back with some possible manipulations. Each of the five electroacoustic texture corresponds then to a Routine, triggered by a MIDI controller in exact moments indicated in the instrumental score. In turn, each Routine is subdivided into a sequence of Patterns, that establish how the SynthDefs are to be played (which pitches or chords, durations, distribution in audio channels, etc. ), mixing determined sequences with random variations inside groups of values. Something interesting about this programming is that even though several aspects are predetermined (triggering moments, total duration and temporal subdivisions and pitches), several internal details are not. In other words, values are calculated for global effects that are always similar (certain "clouds" of sound, with identifiable gerenal contours), but there is some impredictability in the textures, programmed inside the Patterns. , there was no intent to determine an exact instrumentation prior to my arrival in Seia. Though it is hard to evaluate to what extent this choice was productive for the compositional process, I wanted to establish an initial relationship with the Conservatoire's professors. So it would be possible to talk to each one and check out who would be both available and willing to embark in this challenge of rehearsing and performing a brand new piece that was still to be written. Before deciding the instrumental set-up of the piece, I started sketching some more abstract pre-compositional materials. 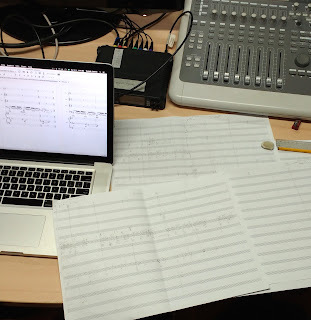 This way, some paths to be trodden by the music could be outlined, before starting to write the actual score. Harmonic material and formal proportions were the first elements to be developed. An approach similar to the one I've been exploring in some pieces since the trio resto do incêndio (2013) was chosen. It's worth observing the two last notes in the sequence repeat the two first ones, indicating that the process is starting a new identical loop from now on. To avoid this, the fixed interval grows by one semitone while the moving intervals are kept the same. This way the second sequence will have the major second as a fixed interval; the third one, a minor third; the fourth one a major third and so on (procedures like these I call “harmonic LFO”, as a reference to the Low Frequency Oscillators present in many electronic synthesizers to produce fluctuations in sound with speeds below 20hz). Something that is musically interesting is that the interval chosen as the first of the moving intervals becomes a characteristic sonority that helps articulate the piece. 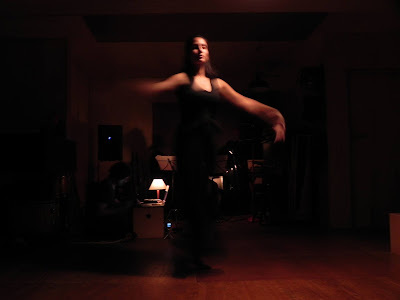 In resto do incêndio (2013), the minor third was the first interval; in memorial do granito (2015) for piano and electronic sounds, it was the minor third; in rasgada [pocket poems] (2015), for voice and violin, the major second. For this new piece the minor second was the sonority to be explored (characterizing quick almost-chromatic gestures, which are particularly present in the cello part). Temporal distribution of harmonic content is another important feature in the planning of my pieces. Generally, time proportions of my compositions are organized via the manipulation of prime numbers. Making a long story extremely short, prime number interest me mainly for being rational elements (numbers, abstract quantities) which in some sense resist their complete aprehension by reason. From a mathematical point of view, they are present in so far unsolves problems such as the Riemann hipothesis (which we won't detail here). In a musical context, prime number are capable of generating very interesting irrgularities, that despite being calculated generate some imprevisibilty in perception. For example, listening to two following musical phrases, being one 13 beats long and the other 11 beats long, our listening tries to find simmetry, which eventually escapes, as if there was a slight distortion in our expectations. The strategy of organizing divisions and subdivisions in several scales of the musical form using prime numbers has been very productive and rich in possibilities in my music in the last years. The first piece to experiment extensively on prime numbers was liederschaflich (2008), scored for violin and piano, being since them a recurring element in most of my works. From 2013 on, the possibility of creating "formal accidents" caught my attention, producing deviations in prime number sequences caused by random scrambling (though these are relatively simple procedures, often they are done electronically, for quickness and ease of repeating). Nevertheless, chance operations are never given too much authority. I don't refrain from repeating the procedure if the obtained results seem inappropriate or making arbitrary modifications in results, accordingly to more intuitive musical criteria (it is interesting that after some years working with number sequences, one develops an "ear" for them). Thus there is no magical belief that chance procedures may bring better or worse results. They are just external stimuli introduced in my compositional process that many times suggest me paths outside of inertial habits one acquires as experience in some activity is accumulated. Parallel to those more abstact speculations, talking to the Ensemble DME musicians led me to this lineup: Carlos Silva (bass clarinet), Hugo Passeira (piano), José Pedro Sousa (cello) and Ludovic Afonso (violin). Still there were two functions to be carried out: conduct the ensemble and trigger the electronic sounds that were to be programmed.